Most of the offices that have installed the Camera Track have drop ceilings. Recently one of my customers had a general contract do the install and I was shocked when told the cost. After talking him I contacted a local architect and he referred me to a “Ceiling Contractor” that specialized in drop ceilings and acoustics. Hatfield Ceiling & Acoustics in Eugene Oregon recommended installing a cross member at each end of the room that is tied into the drop ceiling then attaching the overhead rail with cost being $300-500 or even less for new construction. The top rail is attached to the cross member on the ceiling with the subject end of the rail 2-3 ft. from the back wall. Next the vertical post and pull strap are attached to the upper slide. 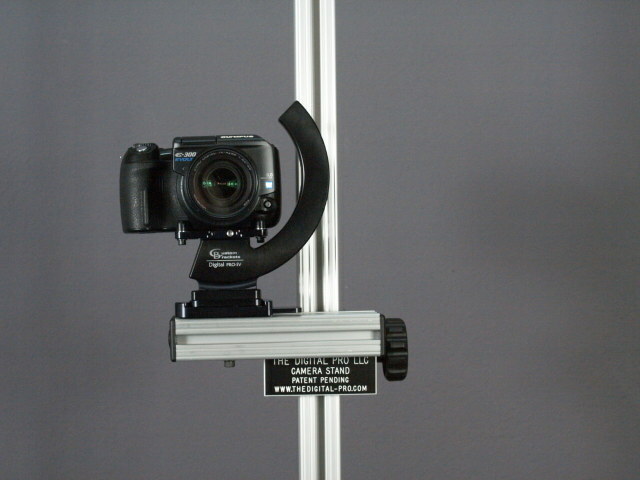 The vertical slide is installed on the rail with the camera bracket base plate, and optional ring light mount and optional laser disto mount. Safety stop is screwed into place on the bottom of the vertical shaft. Camera and Rotating Bracket in place with quick release. O.